For the novice, international shipping can seem complex and scary. It certainly involves a lot of paperwork and can take a lot of time. Hornet are here to guide you through all that, but an understanding of the basics can be useful. So here’s a real beginner’s guide to some of the things you need to consider. What Shipping Method is best for you? Choosing the best shipping method involves trade-offs. The obvious one is the speed of air freight versus the low cost of sea freight, but there are other factors to consider too. We’ve listed common shipping methods below, in order from fastest to slowest. The courier business model is to collect lots of small shipments into a hub location, ship to another hub and then distribute back out again. Courier companies like TNT and DHL have streamlined arrangements for customs clearance and may operate their own planes to ensure distribution capacity. Time from shipment in China to delivery in Australia may be as low as two or three days. Couriers are great for small, light, high value items which are needed urgently. Hornet uses them extensively for samples. But couriers can become expensive if you have any significant volume. The next quickest option is standard air freight, which generally takes four to seven days from shipment to delivery. Shipments can be anything from a few kilos to around a tonne. If you’re shipping bulky items, look out for volumetric weight – cargo space is limited, so you may have to pay based on the space it takes up rather than the weight. Air freight is commonly used for relatively high value items. Although it’s more expensive than ocean freight, you only need a week of stock in transit to ensure steady supply, rather than one or two months’ worth. 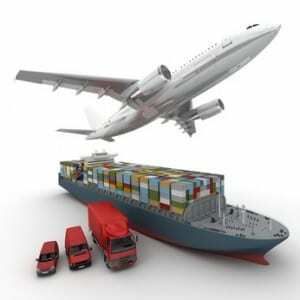 You may also choose to air freight stock if a project has short leadtimes or runs late. Or you may fly the first shipment in to fulfil immediate need, then send future shipments by sea. Air freight rates change all the time – and some times of year, like Christmas you know it’s going to be more expensive. Hornet prefer to give estimates rather than quotes, until you know exactly when you’ll be shipping. The only really practical option for most very bulky or heavy goods is ocean freight, but transit times are measured in months rather than days. It’s not just the time on the seas – container ships spend quite some time in port packing and unpacking too! Most goods shipped by sea are packed in containers – reusable steel boxes which come in standard sizes and can be easily transferred from trucks or rail cars to container ships with no need to unload the contents. There are around 17 million containers in use in the world and the commonest sizes are 40 foot and 20 foot containers. FCL or full container load means that one or more containers are dedicated to your goods alone. The schedule (as far as possible around ship sailing times) is tailored to your needs. Most FCL shipments clear customs without need to open for inspection, so the container can be delivered to you promptly soon after it’s unloaded from the ship. LCL stands for ‘Less than Container Load’. Where individual shippers don’t have enough volume to fill a complete container, a logistics provider will consolidate a number of shipments into one. While LCL enables shipment of smaller volumes, it also adds time. As shipper, you no longer control the schedule – it’s now up to the logistics provider. You may find your goods are waiting to achieve a full payload rather than being shipped immediately. And the container will be delivered to an interim point for unpacking into separate shipments, rather than going directly to you. Drop shipping involves the delivery of products direct to your end customer, rather than to you. The aim is to save time and money by eliminating repeat handling. Hornet offers the option of warehousing in China and drop-shipping to client locations globally. Alternatively, if your client base is in Australia, it may be more cost-effective to ship in bulk to our local Australian partner Xpadite, then drop ship to individual customers from their warehouse. For more information on shipping methods or to discuss your individual needs, please contact Hornet Group. Beginner’s Guide to Shipping Part Two looks at Shipping Terms and how to make sure you don’t get hit by unexpected costs. Hornet Import & Export Group's solutions make importing from China easy and cost effective. Based in China and Australia, our team of English-speaking Chinese experts are skilled at product sourcing, manufacturing, negotiation and quality control.